Downtown is still the center of the Los Angeles cocktail universe, but the Hollywood scene continues to grow with this week’s debut of Next Door Lounge, which soft opened on Wednesday after a series of preview nights. 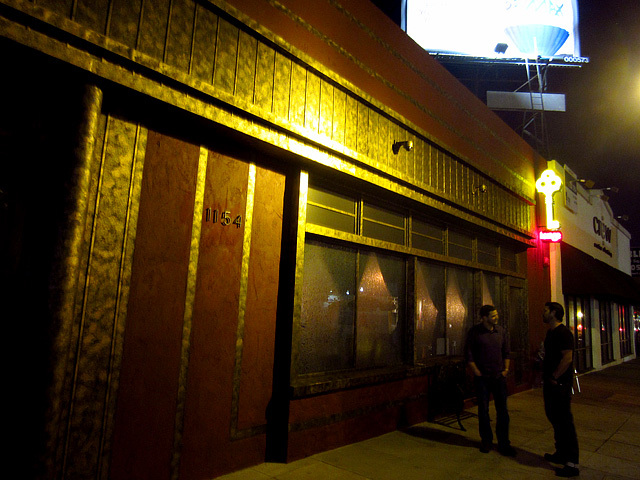 Next Door Lounge comes from the same team that opened The Hollywood Corner, which is located next door to the new bar. 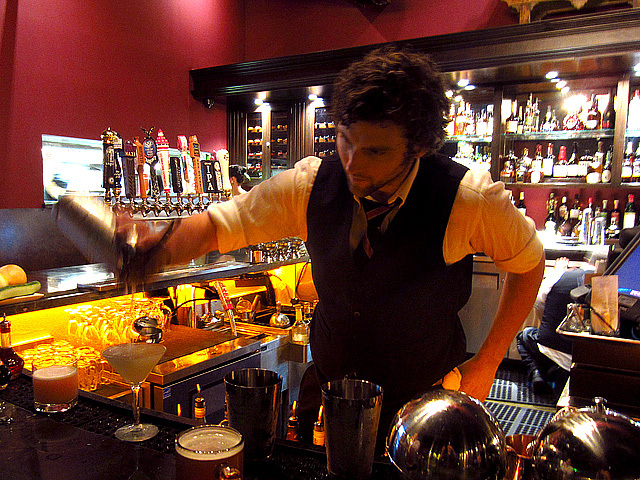 Next Door Lounge scored something of a coup by hiring Joseph Brooke, who was previously the Director of Spirits at The Edison. 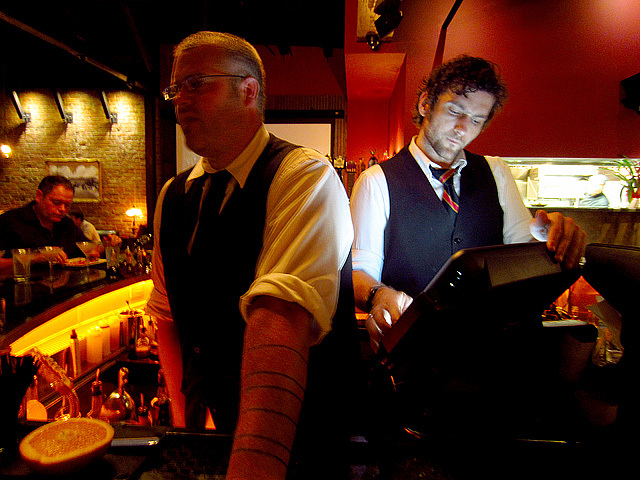 The drink menu is divided into Classic Cocktails (French 75, Tequila Daisy, Ward 8 et al) and Modern Cocktails. With a couple of exceptions, the drinks are $12 each. A nattily attired doorman welcomed us into the loft-like Highland Avenue space, which owner Ferris Wehbe has designed to evoke the Roaring Twenties with some modern touches. 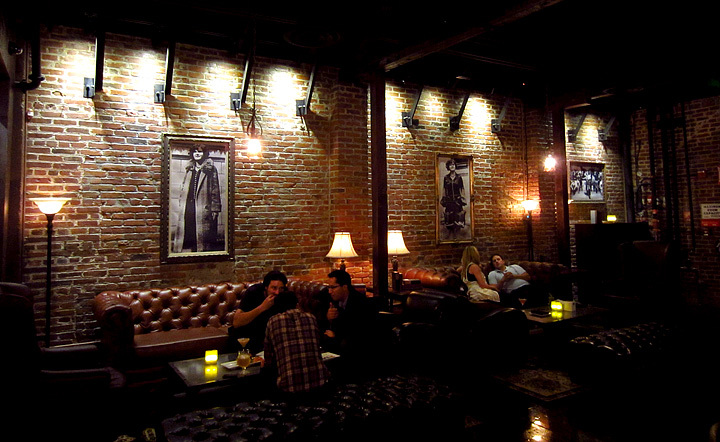 Next Door Lounge is being presented as a neo-speakeasy, but thankfully no passwords are required and the venue is easy to find; just look for the neon key and “LOUNGE” sign out front. With its high vaulted ceiling, exposed beams and open floor plan, the 4000 square-foot lounge is certainly the roomiest speakeasy you’ll ever enter. Roger Room’s Damian Windsor (L) joined Brooke behind the stick on opening night. 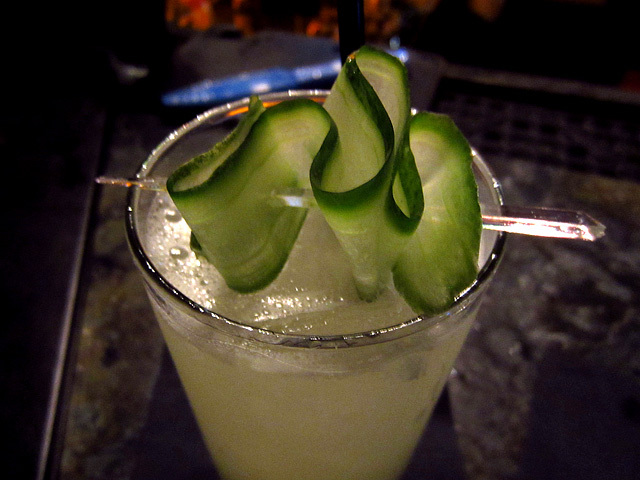 I started with one of Next Door’s Moderns, the Volstead & Vice ($14): Ilegal Mezcal Joven, Pernod Absinthe, cucumber water, agave nectar and lime juice. Nicely balanced and refreshing, with the Ilegal providing just enough smoke without being overpowering. 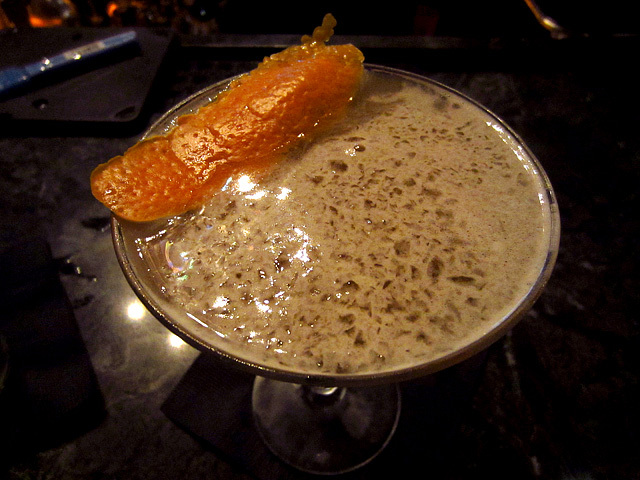 Since we were stopping by after another event, the Volstead & Vice was a perfect way to ease into the new menu. Lena went with another Modern, The Shimmy: Hennessy VS, Sazerac Rye, jasmine liqueur, blood orange liqueur and lemon juice. Another winner and one that Lena really enjoyed. As luck would have it, we had chosen two of Brooke’s creations. Apparently not all of the signature cocktails are his recipes, which is puzzling. If you’re going to bring someone of Brooke’s caliber on board, why not give him free rein and let him do what he does best? Still, we were off to a good start, and with our provisions in hand we looked around the space. 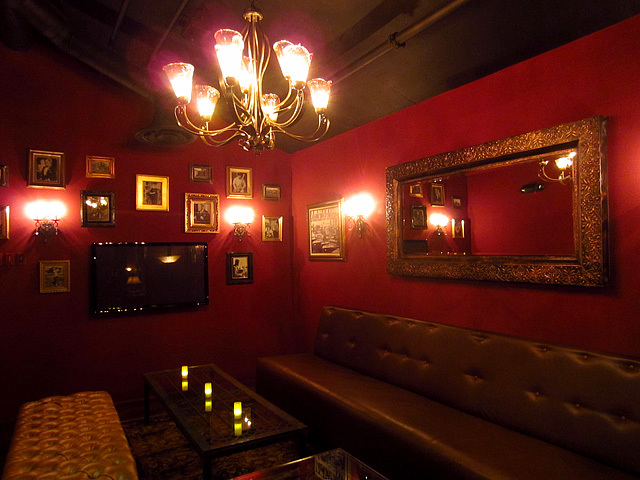 Next Door Lounge has plenty of seating options for groups, from the various oversize leather couches to the large communal tables along the west wall. 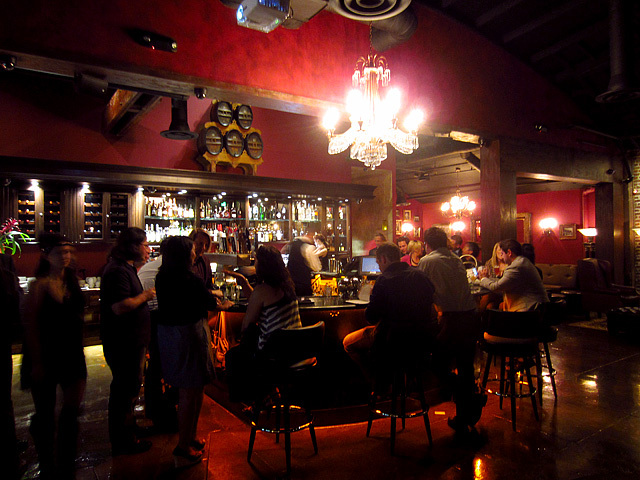 Bistro and cocktail tables are clustered in front of the bar. A seating area, tucked into a corner space. 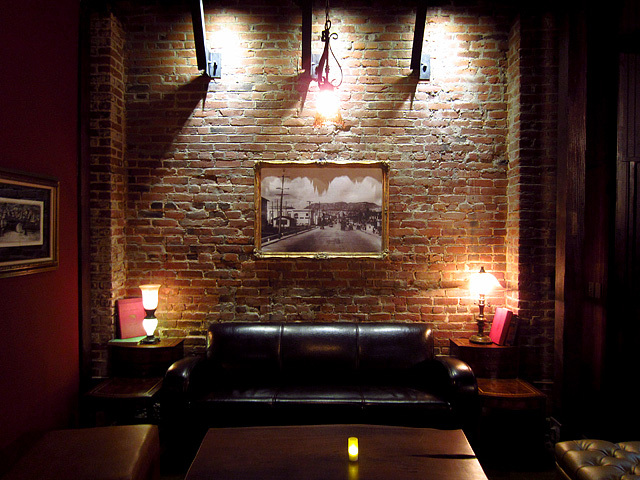 Low lighting, wood accents and deep red walls give the industrial space a warmer patina. Vintage sconces, chandeliers and photos add to the 1920s mood, while TCM is projected on a large screen to provide some visuals. Friendly flapper girls serve cocktails and bar bites from Executive Chef Fidel Mendez, who also features pizzas from the wood-burning oven. Amy had arrived at this point, and as she looked at the menu we explained the cocktail situation. 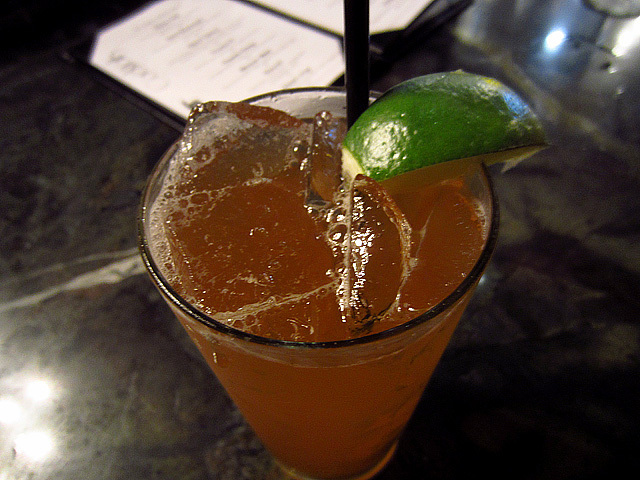 Although she liked our choices, she wanted to try something different and opted for the Marry Me Honey, made with Belvedere Bloody Mary, clover honey syrup, lemon juice, grapefruit juice and orange bitters. I took a sip and the first word that came to mind was “interesting.” Amy said she thought the exact same thing; not good or bad, just…interesting. Lena didn’t fare so well with her second order, the Hoover’s Wig: Flor de Caña 4-Year, Aperol, Carpano Antica, apple juice, lemon juice, a splash of orange juice, and prosecco. She’s usually very forgiving with cocktails, but this was a rare instance where she had to ask Brooke if she could have another Shimmy instead. 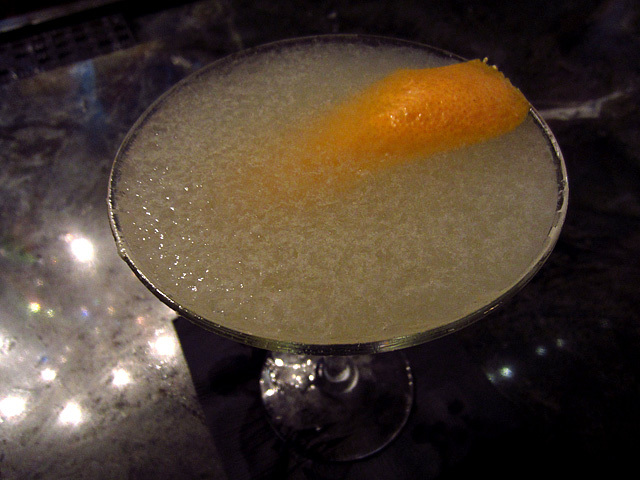 I went with another enjoyable Brooke creation, The Bump-Off: Sagatiba Pura Cachaça, ginger syrup, orgeat, lemon juice. Bright, with a bit of snap from the ginger and a subtle tartness. Amy finished with a Clover Club, a nicely executed version of the classic made with No. 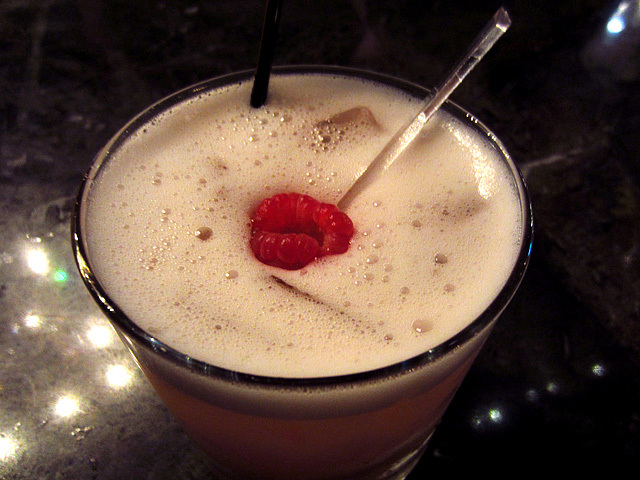 3 Gin, lemon juice, fresh raspberries, and pasteurized egg white. With Joseph Brooke heading the bar and its handsomely designed interior, Next Door Lounge has the potential to be a breakout craft cocktail destination. As with any venue in soft open, aspects of Next Door Lounge are in flux and likely to change after this post goes live. Here’s hoping the management team will let Brooke do his thing and he can truly put his stamp on the cocktail menu. 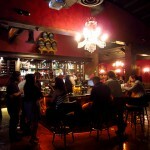 Next Door Lounge is open Tuesday through Sunday from 5pm to 2am.